I was tempted to call this entry "junk apologetics," cleverly referring to the Chinese sail ship because this item comes to us (like Suzanne's tea and oranges) all the way from China. But then I thought better of it. I will start out on this topic by going through a historical back door. The famous Rosetta stone was first discovered by Europeans in 1799. As one of Napoleon's souvenirs of his misadventure in Egypt, it became England's possession when that country helped move the annoying Corsican out of Africa, and the stone wound up on public display in London in 1802. There it became a center of attraction for scholars from all over Europe to copy it, make imprints of it, do whatever it would take to go home and decipher the hieroglyphics on this rock. (See C. W. Ceram, Gods, Graves and Scholars for a fascinating account of this story. New York: Vintage, 1978). Up to that point, although hieroglyphics had been known for quite a while, no one had been able to figure out their meaning. Some people concluded that they had no meaning; others thought that they had found the key and published translations of various inscriptions with content that would make the pharaohs crawl back out of their pyramids. Jean-François Champollion (1790-1832) finally brought it off in 1822 after some intense study and forcing himself to rethink the presuppositions that were leading everyone else into either abject failure or just plain nonsense. What Champollion advocated, and what earned him a certain amount of scorn at first, was to get away from the idea that the hieroglyphics were a form of picture writing. Pure picture-writing ("pictographs") would be little caricatures representing the words for particular objects. So, if you drew a picture of a man with a spear, that could mean "man with a spear" or "hunter," and if you drew a representation of a buffalo, you might be expressing the word "buffalo." I trust you're following me here. 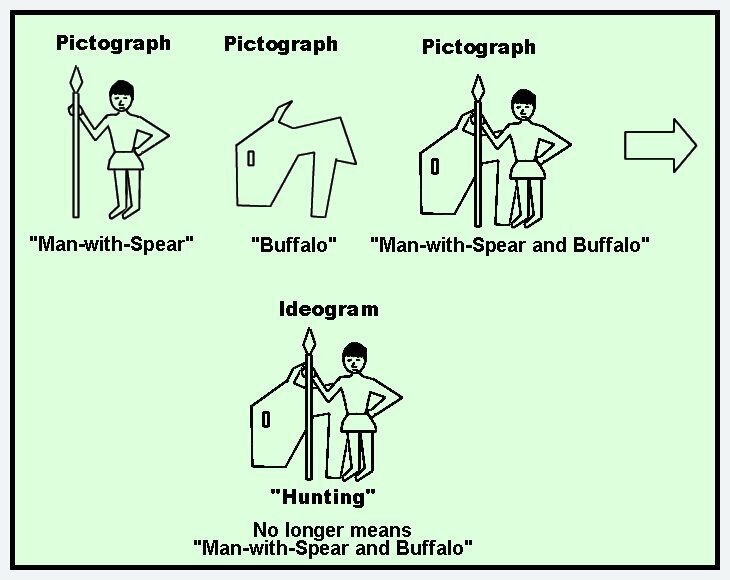 Now, if you drew the two pictures next to each other, they might originally mean "a man with a spear and a buffalo," but chances are that they will contribute to each other's meaning and combine to represent the word "hunt" or the idea of "hunting." You would have created a new character in the script for your language, an ideogram, viz. a picture that represents, not just an object, but an idea, which would then apply just as much to a woman shooting a gazelle with a bow as a man hunting a buffalo with a spear. Thus, this is the hard part for the decoders of a picture-based alphabet: There comes a time in the life of a script when the pictures no longer mean what they are picturing. They turn into concepts, and then into letters of an alphabet or phonemes of a syllabet. So, you might see a falcon, but whatever role the picture of the falcon may play in the newly developed form of writing, it will not have anything to do with birds of prey. This is where the scholars trying to decipher the Rosetta Stone got hung up, even though it was practically an "interlinear" inscription, providing translations of essentially the same message in Demotic script (Egyptian writing from around the Ptolemaic era) and in classical Greek. It was only when Champollion had totally weaned himself off the idea that all of the little pictures represented objects, that he could make his famous break-through. Let the above serve as an introduction to the issue I'm about to take up, which is the theory that certain ancient Chinese characters were composed in such a way that they contain an account paralleling Genesis 1-11. Now, I won't try to pretend to be an expert on Chinese, and I will attempt to limit myself to what I do know. In the foreword to the seminal book for this discussion, Paul A. Zimmerman states, "Among the book's virtues is that it can be read with appreciation and understanding by those who are neither students of language nor conversant with Chinese." So, according to the book, I'm competent to appreciate and understand it, and I assume that if those are possible, then it's also permissible to comment on the parts that I understand but can't quite bring myself to appreciate. I'm concerned with linguistic patterns and mythology, and, actually, being able to converse in Chinese would not help one way or the other for this discussion. The theory to which I'm referring has been around for more than half a century now, but I first learned about it this summer when brother Wolf sent me an article concerning it and asked me what I thought of it. I gave him a hopefully nicely qualified answer and thought I was done with the matter. Then I realized that the book by Chan Kei Thong, Finding God in Ancient China (Grand Rapids: Zondervan, 2009) has devoted some space to it. So, I recently asked a friend in Singapore if he was familiar with the idea, and he not only was, but gave me some more sources. Then I got really curious, and over the last couple of days spent a bit of time chasing down more information, finding that a lot of people have taken it up as a part of their apologetics arsenal. Some time before 1950, C. H. Kang, a chaplain at a missionary hospital in China, was stumped for external corroboration of the early narratives in Genesis. He thought that he had finally discovered some when, in a Mandarin dictionary, he learned that the Chinese character for "boat" consisted of a combination of three other characters: "vessel," "mouth" (meaning a person), and the number "8." 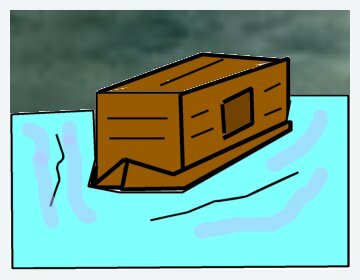 Thus, the original character for "boat" made reference to eight people on a vessel--what an amazing vestigial memory of Noah and his family on the ark! The illustration below comes from the Genesis Website. Inspired by this insight, he discovered quite a few more similar instances and self-published a small book in Hong Kong, entitled Genesis and the Chinese. A medical pathologist, retired from the mission field, Ethel R. Nelson, eventually collaborated with Pastor Kang on a more elaborate book, called The Discovery of Genesis: How the Truths of Genesis Were Found Hidden in the Chinese Language, published in 1979 by Concordia Press in St. Louis. Since then, their work has been incorporated by quite a few apologists, particularly by some groups whose reason for existence is particularly to defend the truth of Genesis and its creation account. Here is another example. Let's look at the alleged etymology of the ancient Chinese word for creation. We have to proceed in two steps. First, we add the signs for "dust," "breath," and "alive," which yields "to talk." Then, when we combine "to talk" with "walking," the newly emerged compound character is the one that means "to create." Thus, an analysis of the character for "creation" tells the story of Adam: He was made from the dust of the earth and became alive when God put his breath into him. So, now he became a talking and walking being, and that's what creation is all about: making a new being who is alive, starting with nothing but dirt. Let these two examples stand for the many that Nelson and Kang believe they had found, paralleling the biblical stories of creation, the creation of the first woman, the fall, the flood, leading right up to the disaster of the Tower of Babel. All of these stories were supposedly encrypted in the ancient Chinese characters. The authors considered this phenomenon to be a wonderful support of the Genesis account because here a culture that was totally different from that of the Hebrews had preserved the biblical narrative with remarkable accuracy. Of course, after the Tower of Babel, the Chinese moved east, and so we shouldn't expect any further parallels to Genesis, though some people claim other similarities in fundamental religious concepts of the Chinese people and the Hebrews. Now, I'm going to raise some critical questions, but let me first enumerate as much as I can think of that I share with the advocates of this theory. I accept the historicity and facticity of Genesis 1-11. I believe that a good case can be made that Shangdi, ancient god of China, is the God of original monotheism, viz. the one and only true God. I'm quite sure that there is good evidence that a religion resembling that of the early Hebrews at a minimum can be extrapolated from the information we have as having been practiced in ancient China. However, I'm not sure that the case for early Old Testament narratives being embedded in Chinese writing can be substantiated with plausibility. Now, I need to write with caution here, lest I overstep my own bounds of expertise. However, I have mentioned, and will continue to mention the occupations of those who are advocating this theory. There doesn't seem to be a linguist in the bunch. In fact I want to zero in on one article to which my friend in Singapore pointed me: Kui Shin Voo, Rich Sheeley, and Larry Hovee, "Noah's Ark hidden in the ancient Chinese characters" Journal of Creation (Previously: TJ) 19,2 (August 2005):96-108. These three authors are respectively a Ph.D. in genetics, an evangelist to the Chinese people in Singapore, and an architect. I'm not saying this to impugn their work or their conclusions; I'm merely trying to close the door on anyone questioning my credentials for engaging with the issue in contrast to those of others. There's a basic principle in linguistics that the etymology of a word (or other communicative sign) cannot disclose the true meaning of the word. It can give us some worthwhile insights into how language has changed, but it cannot make a word mean in the present what it used to mean or derive insights into its present meaning from its supposed constituent parts. To put it into linguistic jargon, the diachronic meaning of a word cannot disclose its synchronic meaning. Here's what happened just a few moments ago. Without having any idea of what I might encounter, I thought I would see if there was a good example of this principle in English. So, the word "pedigree" just popped into my head, and I looked up the "Wiktionary" article on the word "pedigree." Lo and behold, I couldn't find a better example. A pedigree is, of course, a term for a person's or animal's genetic descent. But the word stems from a combination of two Latin words, namely, as the article presented it, pedem and gruem, (--why did they use the accusative case?) meaning "foot" and "crane" respectively. Thus, the original compound word was "foot of a crane." This is fascinating, and I wonder how the change in meaning came about, but it is totally irrelevant to the meaning of "pedigree" in contemporary English. And, yes, in Chinese we find some truly astounding transformations of the meanings of words as well. See Arthur Waley, The Way and Its Power: A Study of the Tao Te Ching and Its Place in Chinese Thought (New York: Grove, 1958), pp. 59-68 for some good examples. So, one could object to the point that I'm trying to make here by asking, Doesn't it help to limit the words you analyze to the most ancient ones, as Voo et. al., have attempted to do? Not really because in looking at even the most ancient characters, you are still stipulating a pre-history in which that character was supposedly assembled. According to DeFrancis (1984), the vast majority of Chinese characters (83% of those in common use based on an analysis by Chen Heqin) are phonetic compounds of this type. For example, the character 媽, used to mean 'mother', is composed of the elements 女 'woman' and 馬 'horse'. While the component meaning 'woman' hints that the character has something to do with women, the component meaning 'horse' in fact establishes pronunciation - both the 'mother' and 'horse' morphemes are pronounced /ma/, albeit with different tones. Another similar case, as far as I can tell, is that, according to most experts, the supposed "8" in the character for "boat" is actually a phonetic guide, not the numeral 8 as integer. Many Chinese characters can be interpreted so that you see whatever you want. It's like looking at clouds. However, there do exist particular interpretations that are probably correct -- ones that reflect the intentions of the character's maker. Etymological dictionaries can be researched to find these correct interpretations, which are derived from studies of character evolvement over time. The fact that I've seen many characters whose standard etymological interpretations conflict with Kang's suggests to me that Kang may have conjured many interpretations out of his own volition. Admittedly, some of the interpretations seem very convincing; however, some others are just laughable. He concludes by quoting the appropriate proverb, "When all you have is a hammer, everything looks like a nail." For a truly technical summary that really takes the air out of much of the dissection of Chinese characters into self-contained components, there is a good piece by Victor H. Mair, Professor of Chinese Language and Literature at the University of Pennsylvania. His central topic is a different Chinese character, but he then generalizes the subject matter so that Kang, Nelson, and others who pursue similar notions can also be accommodated to his correction. Now, I have to tell you that I would probably not have bothered writing any of the above tonight if some people did not take this issue a step further, but I won't get to that step tonight any more. I do think that it's a mistake in Christian apologetics to use one side of a rather debatable issue as evidence for the truth of the Bible. If you read the entire book by Nelson and Kang, you may get overwhelmed by the way in which they chose synonyms as necessary to make things come out right. At that, there are some strange omissions; e.g., the supposed representation of the temptation of Eve in the garden makes reference to the devil, but it leaves out the a reference to Satan's appearance as a serpent, an important detail in the story qua story. Thus, I don't think the case as a whole is strong enough to use as an argument that the Chinese knew of the Genesis account in detail, let alone on behalf of the truth of Genesis. A supposed piece of evidence that is highly disputable in its own right is more likely to become a roadblock rather than a bridge. Still, it appears that there will always be people who attempt to walk on such weak planks, and, as long as they do so with full scholarly integrity, without bending the facts, we cannot fault them. However, it's the "further step" to which I alluded above that really motivates me to write on this subject because at that point I cannot get away from the impression of some deliberate fact-twisting. I'll tell you about that part in the next entry. One of the biggest obstacles that my ministry partners (D.M. and Wyatt) and I seem to be facing almost every day is, what Wyatt calls the "colonizing" of religious beliefs. This tactic occurs whenever a religion , call it A, reinterprets the beliefs of religion B, so that it can say that actually the beliefs of religion B are just another way of stating what religion A holds, and thus, religion B has always only been a subset of religion A. This is a somewhat aggressive form of an inclusivist view of all religions. It is not really a form of relativism because insofar as it may say that all religions are equally true, the truth of those religions becomes the truth of the colonizing religion. Thus, for example, when certain Buddhists or Hindus claim that ultimately Christianity is just as true as their religions, what they mean is that, at heart, Christianity ultimately reduces to Buddhism or Hinduism, as the case may be. Needless to say, and this is why I'm calling it "aggressive," such an attempt at colonization is always a tour-de-force. The religion being colonized has to be changed in order to adapt it to the colonizing religion. 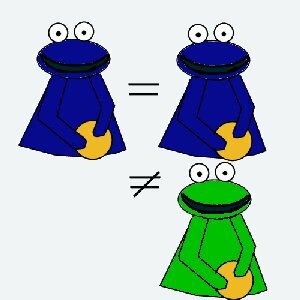 This is not a hard thing to do if you make use of the principle that all things are the same so long as you ignore the differences, a rather slanted use of Leibniz's Principle of the Identity of Indiscernibles, known to my students for many years as the "Cookie Monster principle" ("If you do not differ from cookie monster, then you are cookie monster"). Furthermore, even if this is done under the guise of religious ecumenism or tolerance of all religions, which sounds positive on the surface, from the point of view of the true believer in religion B, it co-opts the integrity of his religion. Insofar as someone may hold core beliefs that do not fit into the system of the colonizing religion, in order to go along with this procedure she would have to abdicate her own religion for all practical purposes. Colonizing is not the same thing as proselytizing, to which a lot of people who practice colonizing object, but it has the same effect. Thus, I react negatively to the attempts at colonization by various people, whether they be adherents of Buddhism, Hinduism, Baha'i, or the nihilism of John Hick, because I am not willing to give up my beliefs for the sake of anyone's triumphalist religious hash. Let Hinduism be Hinduism, Buddhism be Buddhism, Baha'i be Baha'i, Christianity be Christianity, and let John Hick be irrelevant, and let us test the truth of religions without transmorphing one into another. And, oh yeah, let traditional Chinese religion be traditional Chinese religion without forcing a biblical pattern on it. And thus we come to last night's topic of finding implicit references to the narratives of the early books of Genesis embedded in the ancient Chinese characters for such words as "creation" and "flood." My conclusion as of last night was that, as far as I can tell, given what I know about patterns in linguistics, and what I read from some experts on the etymology of Chinese characters, this is at best a weak, unverifiable, strategy that seems to raise more questions than it answers, and thus, even if it turned out that it was true, would probably not be a good tool for Christian apologetics. But, as far as I'm concerned, this is only the beginning of the story. One should think that, if the messages embodied in these characters were a part of the heritage of Chinese beliefs, a story roughly similar to the biblical one would have been maintained in Chinese mythology. Well, to some extent it has, namely inasmuch as Chinese culture, similar to most cultures all over the world, has a story of a huge flood. However, since a flood narrative seems to be found in almost all cultures, that fact by itself does not seem to make much of these alleged special pieces of evidence encrypted in the Chinese writing. There actually are, we are told, clear references to eight people on an ark during a great flood, with the ark eventually lodging in the side of a large mountain, and the eight people becoming the ancestors of all subsequent humanity. I already mentioned yesterday that what they read as the number "8," according to the people carrying credentials in the Chinese language, is more probably a phonetic marker that has nothing to do with the number. From this point on, I will focus on the article by Kui Shin Voo, Rich Sheeley, and Larry Hovee, "Noah's Ark hidden in the ancient Chinese characters" Journal of Creation (Previously: TJ) 19,2 (August 2005):96-108, which you can follow online . It appears to me that with this statement the authors have given away their agenda of deliberately re-interpreting the characters in the light of their project to find Genesis in Chinese writing. However, this understanding of the flood is at odds with the mythology of the Chinese themselves. According to their own version of the story, the flood did not cover all of the mountains. In fact, there was a famous hero named Yu, who should not be confused with either Yu-huang, the jade emperor or with Yu, the first king of the mythological Xia dynasty. The "Great Hero Yu" instructed the people on how to survive on the mountain top and taught them agriculture. He is sometimes worshipped as an agricultural deity, and is widely known to outsiders as the “Chinese Noah.” But he had no vessel floating on the waters, so that appellation is also potentially misleading. In the midst of this global calamity, a hero by the name of ‘Nüwa’ (女媧) appeared and sealed the flood holes with colourful stones and repaired the broken poles using four turtle legs. Nüwa used earth to create humans to replenish mankind after the flood. Although the name Nüwa (女 媧), in Chinese, may today sound like a female first name, at that time it was a common surname. (p. 97, emphasis mine). It is at this point that one begins to question whether the authors' intent has not entirely replaced sound scholarly judgment. Unless one rewrites the legends attributed to pre-historical China, the idea of any "close similarity between the two accounts" is unintelligible. Please keep in mind that I'm favoring the notion of remnants of an original monotheism being present in ancient Chinese culture, but you just can't get there from the pagan culture that replaced it. Nüwa is, and always has been, a goddess. Some people include her among the first Three Sovereigns, but that's a regional matter. She did not create the world, but she created human beings--prior to the flood--and protected them by undoing the flood and fighting threatening creatures afterwards. I'm assuming that the authors reversed the order of creation-by-Nüwa and the flood because they wanted to preserve the notion of Shangdi as the original creator of human beings. Unfortunately, that's not how it reads, and we need to accept that the mythological deities were here, as everywhere, displacing the true Creator God. To do otherwise is to create retroactively a syncretism that never existed historically. Apostasy is universal, and China is no exception. Now here is where I really get bothered. Even though the authors make the statement that Nüwa was a common surname in the third millennium BC, and even though they try to equate her with Noah, they never use a personal pronoun in reference to her, probably because doing so would just have flown totally in the face of the common knowledge that she was female, and they mention some things she is supposed to have done without giving us a good summary of the mythology associated with her. Of course, to do so, would ruin their case. It seems at times that we are supposed to come away with the idea that she, being "Noah," was one of the eight people on the alleged ark. However, they never state so outright, and they actually make that scenario impossible with another outrageous inference, to which we will come presently. So, please allow me to clarify who Nüwa actually was in the mythology, and what she was supposed to have done. The best thing I know to do at this point is to give you a more exact form of the story by quoting directly from a Chinese children's book, published in the People's Republic. (Chinese Myths, Shanghai, China, no date).The advantage of using the children's book is that the stories are kept short, and you get a good summary of the relevant names and events in their correct order. Plus, it gives you a clear picture what is being transmitted as a part of Chinese folklore. And, I must add, even though, as I mentioned above, there are many variations, they give us a basic skeleton that crosses regional boundaries. Furthermore, when it comes to the central characters, Pan Gu and Nüwa, you're not going to find totally different stories concerning them in some hidden set of documents. We must begin with the story of Pan Gu, the giant, who is in some ways reminiscent of Purusha in India or Izanagi in Japan. There is no resemblance to Shangdi or Yahweh, nor should there be. And, by the way, the transliteration of Nüwa in these paragraphs is the alternate Na Wu, but I'm going to substitute Nüwa so as not to compound any possible confusion. "Aeons ago, heaven and earth were commingled like a big egg. Inside the "egg" was a man named Pan Gu, who kept growing slowly until he became a giant of 90,000 miles high. Pan Gu slept for 18,000 years, but one day he woke up. Pan Gu opened his eyes but all he could see was darkness. Feeling bored, he picked up an axe and swung it. Boom! The big "egg" was split into two parts. The lighter part rose and became heaven. The heavier part sank and became earth. Pan Gu feared that heaven and earth would reunite, so he stood up and propped them apart like a pillar. Tens of thousands years later, heaven was so high it was impossible for it to reunite with earth. Pan Gu was exhausted by then so he slumped to the ground. Pan Gu was dead. His left eye became the sun and his right eye the moon. His body turned into mountains. His blood became rivers and his hair turned into trees and flowers. His bones became metals and hard rocks, and his sweat produced rain and dew. "Nüwa was a goddess and one day she arrived in the world created by Pan Gu. As she traveled across mountains and rivers, she decided that something should be added to enliven the new world. When Nüwa felt tired, she sat down by the side of a pond, which reflected her figure like a mirror. Wouldn't it be nice to make something living like me? she thought. Nüwa then began to mould a doll very carefully with water and mud. The clay figure became alive the minute it was put on the ground. He could walk, jump, and speak. Nüwa called him 'human being.' Ah! This was the first human being. Nüwa moulded more clay figures and each one became alive. Moulding clay figures took a lot of time so she picked a rattan and dipped into the mud. Afterwards, each drip of mud which fell from the rattan turned into a human being when it touched the ground. After a while, she divided the human beings into men and women, got them to marry and have children. Thus the new world was alive with human beings. "Gong Gong was a ferocious water god and one day he started a war upon Zhu Rong, a fire god. The two fought from heaven to earth. Gong Gong and his men took a big raft to challenge Zhu Rong. The water god, who was assisted by fish, shrimp and crabs, raised wind and waves. But Zhu Rong was even more fierce and tough. He hit back with raging flames and Gong Gong's troops were seriously burnt. Shamed by his defeat, Gong Gong decided to take his life. He knocked his head against Mount Buzhou in the West. Mount Buzhou was a pillar of heaven. It was broken by Gong Gong. Half the sky fell down. The forest caught fire, great torrents gushed out from underground and the land was turned into a vast ocean. People were either burnt to death or drowned. Gong Gong brought catastrophe to human beings. "Nüwa was deeply grieved when she saw the people she created suffering, so she decided to mend the sky. She collected many coloured stones from the rivers and lakes and melted them into magma. She patched up the cavity of the sky bit by bit. When she saw a giant turtle, she killed it and cut off its four feet. Do you know why? She was afraid that the sky would fall down once more, so she used the turtle's legs as pillars to prop up the sky. Afterwards, she drove away the fierce birds and ferocious animal and when she found a black dragon in the Central Plains that often harmed people, she quickly killed it. Nüwa then burned reeds into ashes and used them to stop the spreading flood. By doing this, she saved the remaining people from disaster." But there is still another highly problematic matter in the article. Who were the eight people on the ark? If Nüwa really had been a counterpart to Noah, she (or her imaginary male version) should have been one of them, but, of course, she wasn't. Voo et. al. conclude that the eight persons on board the ark were the "Eight Immortals" of Daoist legend. The following statement immediately precedes the reference to the "very close similarity" to the biblical narrative and is included in that judgment. Please recollect that it is a definite point of dispute whether the character for "8" as meaning the number 8 is actually present in the character for "boat." And when you come right down to it, the number 8 is about all that the Eight Immortals and the eight members of Noah's group have in common. Not too long ago, I brought up the Eight Immortals on this blog, as I attempted to ascertain their identities on a picture in Taiwan, which (unsurprisingly) led to a somewhat longer study. Click here or on the stitched-together mural composite below for the complete round-up! a. They did cross the sea, but not by boat. Returning from a lengthy birthday party for the goddess of the Western Paradise, they were still in a state of inebriation when it came time to cross the sea. 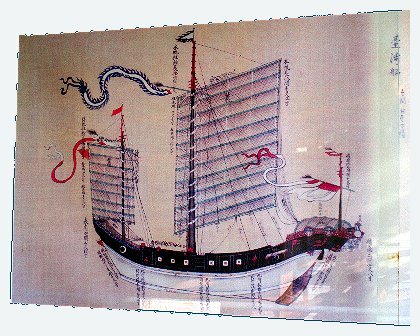 Lü Dong Bin suggested that, instead of using a boat, each of them should cross the sea with their particular special powers. They attempted to do so, but ran into conflict with the Dragon King of the sea because his mother snatched up Lan Cai He and his flowers. We don't need to pursue the rest of the story here. The point is that one starts with a mistake if one assumes that their crossing of the sea must have involved a boat. b. Were the Baxian "eight holy men of unknown origin"? Well, no. Lü Dong Bin was a scholar who lived in the 8th century BC--long after the flood, obviously. We don't have historical confirmation of any of the others, but they all have their "stories" incorporated in the mythology. Dismissive statements such as the above tend to indicate to me that someone did not do their homework. Of course, the article already mentioned earlier that this group of eight consisted of six men and two women. Actually, the more common configuration is seven men and one woman, but I have seen both. What they have in common is that they are representative of the Daoist preoccupation in their day to find the key to personal immortality, usually through some form of alchemy, and these eight disparate people had succeeded. Having attained immortality did not necessarily improve their morality or disposition; hence the somewhat dismissive note by our authors is not inappropriate, as I mentioned. But then, why bring in the Eight Immortals into this segment at all, particularly since I'm not telling you anything that one couldn't find out by the most cursory survey of Chinese mythology? I really can't say, at least not without raising some hard questions. What I feel pressed to say is that, in their eagerness to find the alleged data derived from the characters exemplified in Chinese mythology, they simply picked up whatever they could scrunch in, being pretty sure that their reading public would not go to a lot of trouble checking out what they were saying. I mean, once you talk about oracle bones and then bring up supposedly enigmatic figures like Nüwa, whose name so uncannily resembles that of Noah, who's going to question you? And if someone should, it's always possible to accuse the objector of nitpicking. As I keep insisting, it is imperative that contemporary evangelicals learn about Eastern religions. The alternative is that we are either embarassing or deceiving ourselves or others. The approach about which I wrote last night ("stories embedded in writing characters") seemed to me to be somewhat dubious, and I would suggest that people don't use it as a good argument in apologetics. The subject matter for today included some obvious misdirections in order to bring off what I would consider a very obvious attempt at "colonization." I find this very troublesome. The identities of Nüwa and of the Eight Immortals are so obvious in the world of Chinese legends, that I find it difficult to believe that the authors weren't aware of those facts, though in that case they must have intentionally bent them to add plausibility to their argument. This does nobody any good. Then again, I remember someone delivering a paper at a conference in which he claimed that there was no personal supreme God in historical Chinese religion. When I asked him afterwards, what he made of Shangdi, he conceded that he had never heard of him, a fact that did not prevent him from giving me a lecture on the improbability of original monotheism. So, maybe it's all just ignorance. But still, in that case it's a prideful manipulative ignorance, and that still bothers me. Appendix: A number of Christian websites refer to a translation of a flood story that supposedly is still a part of the traditions of the Miao (Hmong) people. They are a large ethnic minority in China, who have maintained their own language, culture, and traditions. The translation of this myth, produced by Missionary Edgar A. Truax, is truly very close to the biblical accounts. It is posted on the website of the Institute for Creation Research. [Truax, E. A. 1991. Genesis According to the Miao People. Acts & Facts. 20 (4).] The website considers it to be independent testimony to the truth of Genesis. Unfortunately, Mr. Truax's widow copyrighted the translation, and it has not been recorded by anyone else familiar with the Miao people, nor is there any original version in the Miao language, so there is no way of verifying the translation. The website editor rightly states that "we can believe it is authentic until someone can prove otherwise." True enough; we can, but again I would counsel not to use something that is itself controversial as an apologetics argument. Another version of the Miao story of origins is in wide circulation. I am very happy with this apparently authentic version, which parallels the biblical account sufficiently to constitute credible evidence without the appearance of a possible over-sell.